Here’s a nice simple creamy soup that happens to be vegan. It gets that creaminess from the miso paste. It’s full of flavor and homey goodness. It’s perfect for those nights you want something tasty and hot without a lot of work. Heat a 4-quart pot over medium heat and add the oil. Add the leeks and onion and sauté for about 10-15 minutes, stirring often, until the onion begins to brown. Add the sweet potato cubes, vegetable broth, and water, cover, and bring to a boil. Reduce heat to simmer. Simmer 20 minutes until the potatoes are cooked through and easily pierced with a fork. Remove the soup from the heat and allow to cool. Working in batches, ladle the soup into a blender, and blend the soup with the miso and pepper until smooth and free of chunks. Or, add the miso paste to the pot, and use an immersion blender to blend the soup in the pot. Transfer the blended soup back to the original soup pot and warm over low heat until heated through, do not allow soup to boil again or the miso will break. Garnish with additional fresh pepper, herbs, or flowers from the garden. Enjoy! « Are you a runner? It never occured to me to add miso paste to sweet potato soup- so inspiring! This sounds delicious! I’ll have to try it. Sweet potato and miso sounds like a great combination and I had never thought of that before! I have never made miso soup, only had it at sushi restaurants, but have been meaning to make it at home. I love that your soup is simple to make, creamy and nutritious. Will definitely try it soon and let ya know how it goes. Wow, this looks and sounds delicious! Thanks so much for linking up to Creative Thursday this week. I can’t wait to see what you link up next week. Have a wonderful weekend. This looks like a comforting soup! OMG this looks really delis! I am bookmarking and making! If I share on my blog I will be sure to link back! Thanks for sharing, I found you via Finally Friday blog hop. Have a great weekend! 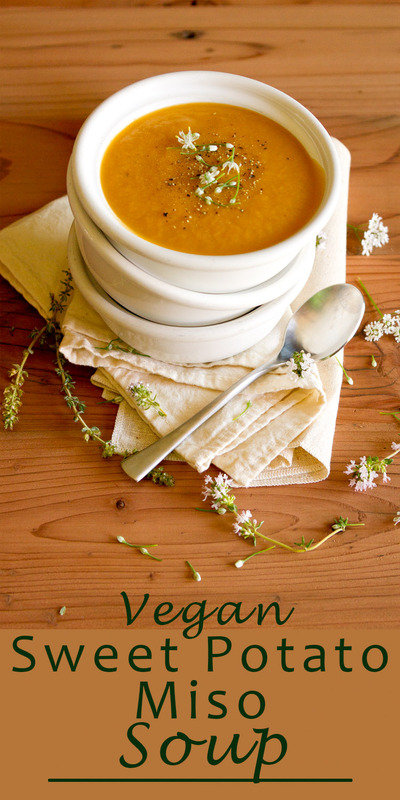 that is one gorgeous soup! i love miso and sweet potato together.. and those cute bowls! This looks wonderful! Thank you for sharing on Thursday’s Treasures Week 32. I hope you will join again Thursday. <3 and hugs! So pretty! I’ve been inspired to investigate edible flowers ever since you shared a soup garnished with chive flowers! I love the simplicity of this soup, and I think the sweet potato and miso is a fantastic combination! Thanks for sharing this with Sunday Night Soup Night, look forward to seeing you again soon. I love any kind of miso soup, thanks. Fascinating I would never have thought of putting miso and sweet potatoes together… but I see how the flavors complement each other salty and sweet and the thickening power of the sweet potato. Please share this on my foodie friday party today. I hadn’t thought of using miso with sweet potatoes, but it sounds like a tasty combo! I love the photo! Stacking the bowls was so creative. Great recipe, my husband and I love incorporating miso! I am exploring a whole plant based diet, and made this without the oil (steamed the veggies instead) and it turned out wonderful. Thanks for sharing!